DOVER, NEW JERSEY, MARCH 28, 2019 — Today, Casio G-SHOCK unveils the latest models of its G-SHOCK Carbon series. 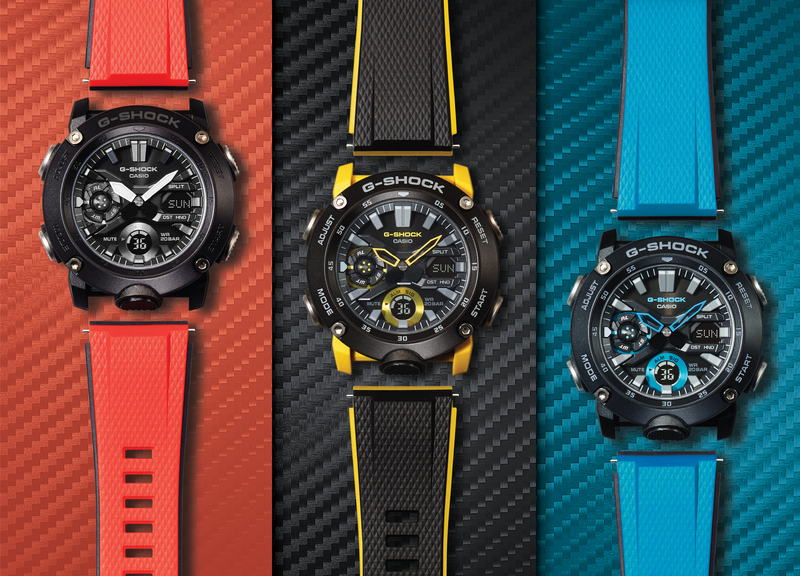 Joining G-SHOCK’s lineup of men’s GA2000 timepieces, the four new watches arrive in an updated, Carbon Core Guard Structure that provides unparalleled toughness in a lightweight case. The eye-catching new watches are available in a variety of bright hues including a yellow (GA2000-1A9), bright blue (GA2000-1A2) and red (GA2000E-4). Additionally, colorways inspired by the military and outdoors will be available including navy (GA2000-2A), olive green (GA2000-3A), and khaki (GA2000-5A). Designed with a nod to both urban and outdoor lifestyles, the latest G-SHOCK Carbon models are built to withstand any and all activities and are made for men that enjoy city life as much as the great outdoors. The Carbon Core Guard is comprised of a carbon fiber reinforced resin case that is combined with large stainless-steel buttons and a thin case back, giving the GA2000 Series an overall functional and lightweight feel. The timepieces also feature unique interchangeable bands making it easy for watch wearers to adapt to any activity or customize their look depending on their personal style. The GA2000-2A, which first debuted at last week’s Baselworld 2019, arrives in a utility colors inspired by the military and great outdoors along with GA2000-3A and GA2000-5A. The versatile model also includes the series’ bi-color resin band with the option to swap for bands made of traditional resin, Velcro, Cordura®, or cloth. The GA2000-1A9 and GA2000-1A2, available in the series’ bright, bi-color resin bands, offer a statement pop of color, but can also be used with a more traditional Velcro, Cordura®, and cloth band, similar to the other models from the series. The limited-edition, GA2000E-4, arrives in a vivid red resin brand and is packaged with two additional bands, including a black resin and green cloth. Equipped with the GA Series’ top line capabilities, the models each include raised dial markers and light-colored hands, with pops of bright features throughout, making for easy to read features in dark lighting. The GA2000-1A9 and GA2000-1A2 will each retail for $130 beginning in April, while the GA2000-2A, GA2000-3A, GA2000-5A ($130) and the limited-edition GA2000E-4 ($160) are set to go on sale starting in May. All models will be available at select jewelers, the G-SHOCK Soho Store and gshock.com.